COMMENT: Where next the railways? Readers should be aware that there will be no long distance trains on the West Coast Main Line Tuesday and Wednesday 25-26 December. On the previous Sunday and Monday the services will be limited and will gradually decrease over the holiday period. This is what will happen whoever is the train operator. Readers will be aware of a spat between current service provider Virgin Trains, the would-be franchise holder First Group, and the Government. Where did The Business Travel News get this service update? It was distributed by the Virgin Trains’ press department, always very good with sending out information and dealing with enquiries. If First Group is to take over this railway line the first thing it needs to do is get its media PR sorted out. Enquiries by this publication are usually ignored and the structure of the company seems to be that each of the five individual railway lines distributes its own news (or in fact does not). It could be added that virtually all the UK rail operators (Chiltern Rail and Virgin Trains excepted) are bad communicators, unlike most of the airlines. The Virgin Trains’ press office originated from Virgin Atlantic and Eurostar. We wish First Group every success if it is to be the West Coast future operator. We supported National Express with its abortive attempt on the east coast line. Readers are aware that on 15 August Justine Greening, the then Transport Minister, announced that the 15-year tenure of Virgin Trains out of Euston would end on 8 December, First Group being awarded a new 14-year franchise. First, the UK's largest rail operator bid a basic £5.5bn to run the line until 2026. The sum was £700m more than Virgin offered. With a likely extension and inflation, the difference rises to £1bn-£2bn. Sir Richard Branson, caught somewhat unaware, was on holiday at the time, but was quick to respond calling the bid "absolutely preposterous". 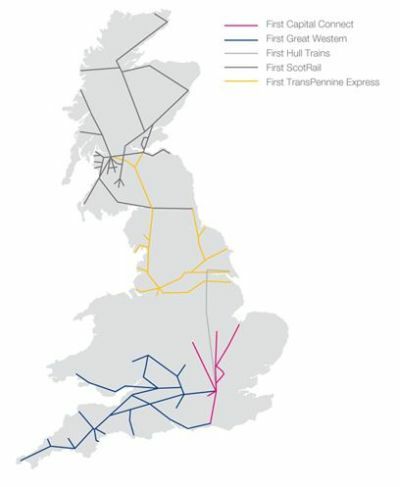 What is very apparent is that First Group would now have a near monopoly of UK mainland long distance train services with the exception of the re-nationalised East Coast Main Line. At this point in time the Department for Transport has been forced to prepare for the temporary nationalisation of the route, because of Virgin Trains’ legal challenge. The High Court is expected to respond in the next couple of weeks whether to allow the takeover to go ahead, or for a (time consuming) judicial enquiry. In the meantime the subject was debated in the House of Commons for 3½ hours last week and prior to that the situation was introduced into a House of Commons Transport Committee hearing with both sides stating their cases. The West Coast Main Line franchise challenge may be sour grapes by Sir Richard Branson on what has proved to be a very lucrative investment but it is, rather like his airline, a stand-alone operation, with no side issues to divert attention. It started off badly and has got better and better. First Group we know little about. Except that it operates five railway lines which might become six.